With semi-transparent icons that look similar to those of Windows Vista, LogicNow Limited presents Perl Desk Help Desk Software. This extensive software is a little more difficult to navigate than some of the others although it offers well-organized customer support and streamlined ticketing, especially for companies that have a high volume of tickets or several representatives responding to them. The software incorporates their Help Desk with live chat, integrated troubleshooter with unlimited branches, a knowledge base with a WYSWYG editor, current news area and integrated calendar within the administrative area. It is a robust program that will keep your system organized and accurate for efficiency. To solve customer's problems more quickly and reduce unnecessary tickets, the automated interface attempts to solve their query before actually submitting it into the system. Filters can also be set up to automatically direct certain tickets to specific representatives, improving response time and quality. As with most Help Desk systems, tickets are recorded and the replies are tracked so administrators and customers, alike, can review original tickets and responses from start to finish. 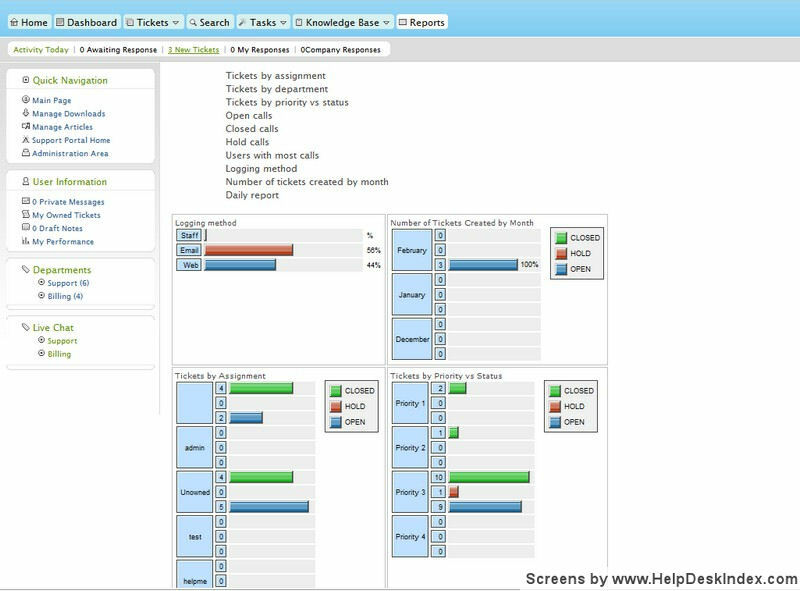 In addition to ticket tracking, Perl Desk offers excellent statistical reporting to detail reoccurring problems and incidents to help you identify areas that might need improvement. Perl Desk is available on a 30-day trial basis for $10, or for purchase for $199.99 for up to 5 staff members with unlimited customer accounts, or $499.99 for unlimited staff members, unlimited customers, plus active directory integration, SLV features and priority support. This program requires MySQL database, Perl and a Linux/Apache server to run on. Due to the complexity of installation, the optional hosted version might be worth considering for $59.95/month or $480/year; thus avoiding any potential difficulties. Customization, with regard to color and theme, does not appear to be an option with this program.